Naturally, the world of interiors is ahead of the curve and this season’s furnishings enable you to bring this freshest of colours into your own home. 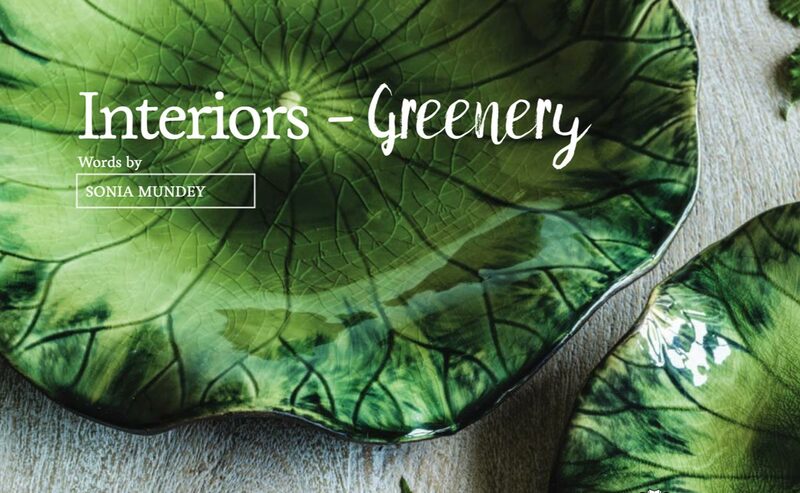 Graham & Green http://www.grahamandgreen.co.uk have introduced some new Lily Pad plates to their collection of tableware. Taking inspiration from vintage designs, they are perfect as serving platters, trinket dishes or decorative wall art. The beautiful crackle glaze is striking and unique and from £22.50 for the Medium 28cm size plate, they will add affordable style to your dining table. Cox & Cox http://www.coxandcox.co.uk have added the new Westbury chair to their range of furniture. Available in Forest Green H-FLUTEGRN the chair is priced at £550.00. It has a beautiful, full shape and stylish fluted back with oak legs. Furthermore, with the 100% cotton velvet achieving 40,000 rubs in the Martindale test it makes it robust enough to be practical as well as the ultimate in lounging luxury. If you love the idea of having plants in your home but lack the green fingers to maintain them, then Cox & Cox also supply a range of stunning indoor foliage. Their Faux Potted Olive Tree H-OLIVETREE priced at £425.00 bears realistic faux olive fruits and soft sage leaves, and at 191cm high will add an elegant, botanical beauty to your home. These and many other Greenery inspired accessories will add a cheerful freshness to your home all year round, but encourage you to get back to nature and enjoy all that Spring has to offer. Published in Just About Dorset magazine for March/April 2017.